All formal business relationships start with contracts, and freelance public relations services are no different. 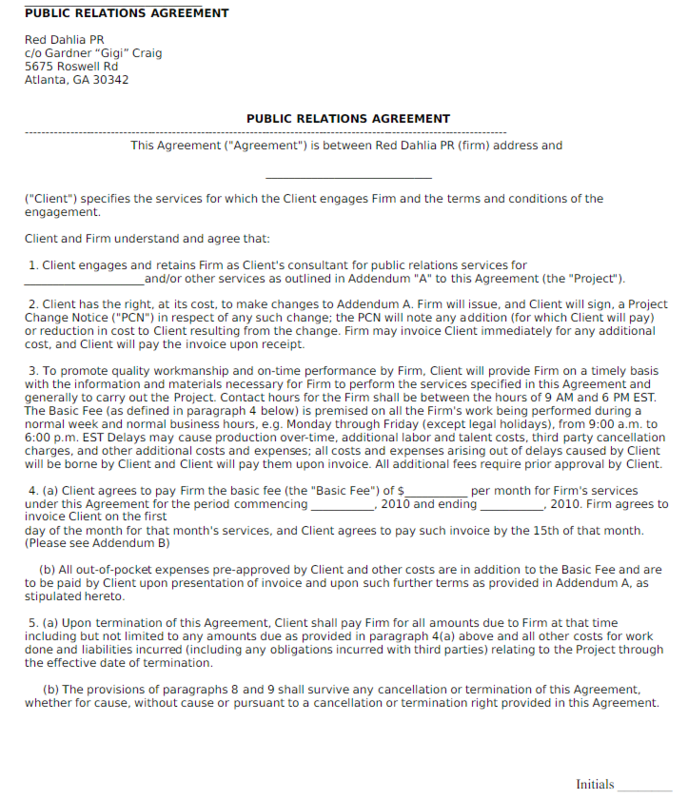 A Public relations contract can be quite a simple document, or it is detailed to the bone. This factor depends on the scope of the PR contract and the entities signing the agreement. However, for freelancers starting out in the PR business, a freelance public relations contract template is considered a saving grace. 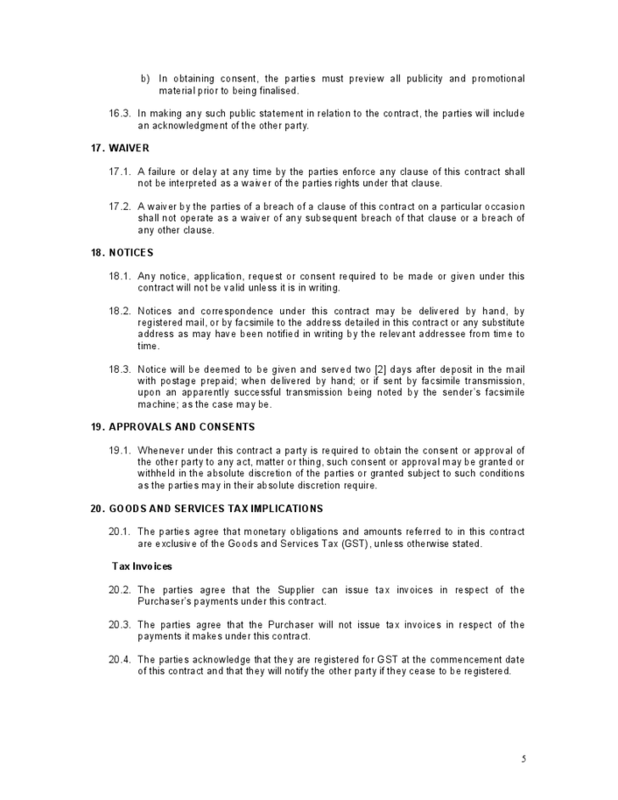 There are numerous contract templates offered all over the internet; some are free while others are not. However, there are important segments that should not miss out from the document. The cover letter is an opportunity for you to summarize your strengths and scope of public relations experience. Some contract templates have an outline of how the cover letter is drafted. The model saves you the time and energy of getting the formal language correctly. Some contract templates have an actual cover letter written, whereby you only need to insert specific details like respective companies' names, dates and other specific data. An excellent freelance public relations contract template will help lay out the specific reasons why your client needs your PR services, and thus defines the scope of work. These services include event coverage, general social media PR needs, extensive media coverage among other PR services. As a freelancer, your scope is limited to your capacity thus it is prudent that the client knows how far you are willing to provide PR services and for how long. This segment of the freelance public relations contract template assists you in outlining the precise nature of the campaign. For example, you will have to specify who the PR campaign is for, what goals are met and how long it will take to achieve these goals. For example, you will outline whom the PR strategy and execution will serve and for which reason (for example, social media coverage). Such outlined details in the public relations contract template assist you in defining the campaign without the risk of having crucial information missing from the final document. Thankfully the templates also come drafted in formal but straightforward language, saving you tons of time that could be spent writing and editing the document to fit the formal business environment. The timeline definition segment is meant to address the issue of the duration your company is expected to achieve the goals the client needs to be met. The timelines are divided into achievable milestones that you will encounter at different stages as you progress. Thankfully, most freelance public relations contract templates come with these milestones already broken down, that is; the duration, the type of service rendered during the period, the media types used as well as success metrics for each milestone. For example, a press campaign template would define for you the pre-announcement, announcement and post-announcement milestones, with different parameters that govern these milestones also being outlined. For most online freelance public relations contract template, this segment is usually outlined, leaving you the only tasks of editing the specific details. The model is a saving grace, considering that most freelancers are swamped undertaking every other job that ensures the business stays afloat. However, it would be prudent to tweak out the section a bit so that it doesn't sound like the run-off-the-mill cliché "about us" segment found on every other website. Include your experience regarding the time you have practiced as a freelance PR company, as well as the success metrics for your previous clients. Feel free to use flowery language but don't go over the top when attributing yourself the success. This segment outlines the different talents that comprise your company. Don't shy away if yours is a one-person show – most freelancers start solo and work their way around to getting more hands on their teams as time goes. Be sure to outline their roles (or your roles) on which projects you are currently working on.